Borehole seal integrity. Surface air intrusion can be checked in real-time, so that sampling can be aborted if desired. 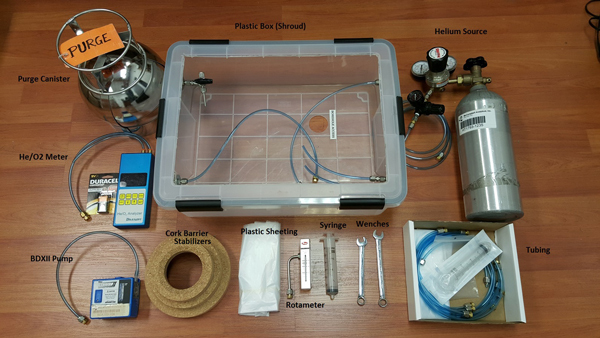 Shrould can be used with MAI supplied purge can, user supplied vacuum pump or a manual syringe. Shut-in-test for leak free manifold verification. 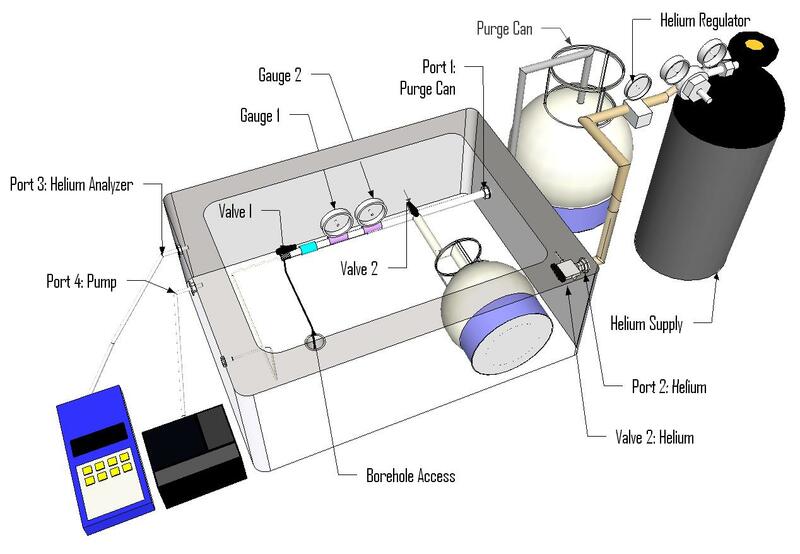 Quantitative measurement of Helium content within shroud, which, combined with lab analysis of Helium content in the sample can, allows quantitative evaluation of a leak with the DTSC <5% criteria. Rota meter and vacuum guages allow assessment of DTSC defined low permeability soils and provides the needed flow/vacuum measurements required for compliant sampling. The special design of MAI's sampling manifolds offer the option for split sampling upon request. Simultaneous duplicate TO15, sequential TO15 followed by TO17 sorbent tube (ST), or simultaneous sampling of a borehole at 2 different depths. Sample technician friendly. Allows flood or trickle/maintenance Helium input. Allows visual monitoring of shroud Helium content. Lightweight, compact and easy to move from borehole to borehold.